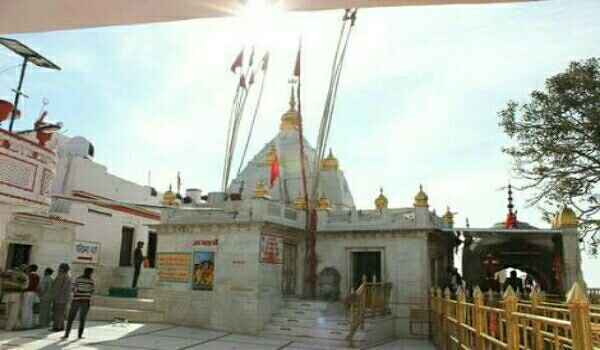 Baba Balaknath temple is located in Deot sidh village of Hamirpur district in Himachal Pradesh. 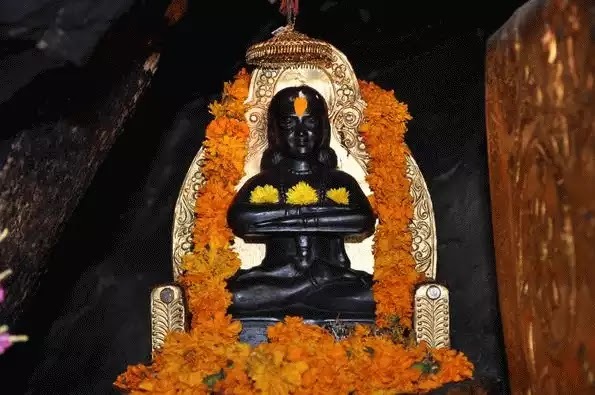 Baba Balaknath ji worshiped in the northern Indian states of Punjab and Himachal Pradesh. Puja/Aarti is done two times a day and prasad or bhog is offered to all devotees in Shri Baba Balaknath ji temple after completion of Aarti. 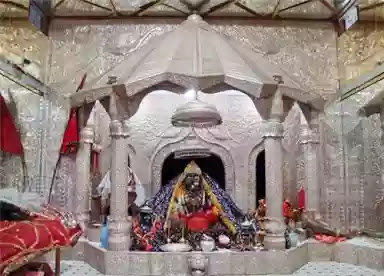 Shrine of Baba Balaknath is situated on a hill-top in village Chakmoh at 45 kms from Hamirpur and is near Hamirpur and Bilaspur both districts. Baba Balaknath temple has natural cave carved in hills and considered as residence of Baba Balaknath ji. The most popular story about the birth of Baba Balak Nath as 'sidh-purush' is associated with the Amar Katha of Lord Shiva. It is said that Lord Shiva was sharing the Amar Katha with Goddess Parwati in the cave of Amarnath, and Goddess Parvati fell asleep.. A kid-parrot was there in the cave and he was listening the entire story and was making noise of 'yes' ("hmm.."). When the story finished, Lord Shiva found Goddess Parwati sleeping and so he understood that someone else had heard the story. He became very angry and threw his Trishul on the kid-parrot. The kid-parrot escaped from there to save his life and Trishul followed him. In the way, the wife of Rishi Vyas was yawning. The kid-parrot entered her stomach through her mouth. The Trishul stopped, as it was unreligious to kill a lady. When Lord Shiva knew all this he also came there and narrated his problem to Rishi Vyas. Rishi Vyas told him that he should wait there and as the kid-parrot would come out, he could kill him. Lord Shiva stood there for a very long time but the kid-parrot did not come out. As Lord Shiva stood there, the whole universe got disordered.. Then all the Lords met Sage Narada and requested him to request Lord Shiva to save the world.. Then Narada came to Lord Shiva and prayed him to leave his anger as the child had already heard the Amar Katha and so now he had become immortal and now nobody could kill him. Listening to this, Lord Shiva told the kid-parrot to came out and in return the kid-parrot demanded a blessing from him. Lord Shiva accepted that and the kid-parrot prayed that as he comes out as a man, any other child who gets birth at the same time would be granted all kind of knowledge and would be immortal. As Lord Shiva accepted this, a divine baby come out from the mouth of Rishi Vyas. He prayed Lord Shiva and got his blessings. This divine baby was called Sukhdev Muni later. The other babies who got birth at that time were famous as Nau Nath and Chaurasi Sidh. One of them was Baba Balak Nath. It is believed about Baba Balak Nath that he takes birth in every age (yug). He appeared as "Skand" in Satyug, as "Kaul" in Treta and as "Mahakaul" in Dwapar. In Dwapar age Baba Balak Nath was in the way to Kailash Dham with a wish to meet Lord Shiva. In the way he met with an old lady. The lady asked him where he is going. Then Baba Balak Nath who was Mahakaul told her that he is praying Lord Shiva since last three births but he had not been blessed by Lord Shiva with his appearance and so he was moving towards Kailash Dham with this very wish. The old lady told Baba that it was not easy to have a live appearance of Lord Shiva. You have to do something extraordinary. When Baba asked her what he should do,she told that Baba should stand in the foothills of the Kailash near ManSarovar and pray there. Mata Parwati used to come there on some occasions for bath. When Mata Parwati comes there he should pray her to fulfill her wish. Mata Parwati will surely try to give him something else but he should insist on his wish only. Baba Balak Nath stood for twelve gharis with the old lady and moved towards the Man Sarovar. He did the same as the old lady had advised him and finally Lord Shiva was pleased and blessed him to be Paramsidh in the Kaliyug and will remain as Balak (young) and age would not affect him. MahaKaul of Dwapar age got birth in Kaliyug at Kathiyawad in the house of Narayan Vishnu and Laxmi. Parent named him as "Dev". Dev was very religious from his childhood and he used to pray all the times. His parents then tried to marry him so that he cannot leave the home. Dev was not ready for this. When he was so much under pressure for marriage he left home and moved towards Girnar Parwat in the search of Paramsiddhi. In Junagarh he met with Swami Dattatreya. Here at the ashram of Swami Dattatreya, he got divine knowledge and emerged as Sidh. As Lord Shiva had blessed him that age will not affect him he remained as a child and called "Balak Nath". Mela of Chaitra is day where people woship divine goddes and celebrated around 14th march to 13th April every year. Vasant Panchmi is celebrated which is dedicated to goddess saraswati and other than this festival of colors Holi is also celebrated in this divine temple. Hindu Festival deciated to maa Parvati and Lord shiva celebrated in temple with lots of joy. Devotees used to celebrate this festival by reciting Shlokas and singing bhajans. Festival of bonding of brother and sister and Ram navmi is also celebrated with lots of spirituality and joy in Baba Balaknath ji temple and Deot Sidh. There are many more festivals like Diwali, Dusshehra, Navratre etc. which are celebrated. To reach by road governement as well as private bus and taxi services are available. - Ladies were not allowed in temple as it is said that baba balaknath ji was brahmachari. - After supereme court decision ban was removed. 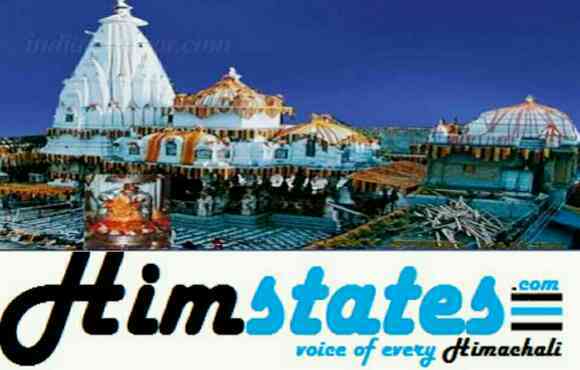 - Baba balaknath temple is mamaged by trust which was formed in year 1987. - Baba balanth ji trut used to run school , colleges etc. - Temple of Baba balaknath is under supervision of more than 100 workers. Bajreshwari or Brajeshwari temple is located in Kangra district of Himachal Pradesh, India. Brajeshwari devi mandir is dedicated to Vajreshwari Devi.Vajreshvari devi temple is also linked with some ancient stories of Mahabharata. History of Brajeshwari temple is linked with Devi sati, Shiva and Lord Vishnu. Brajeshwari temple is located in Nagarakot ,Kangra district of Himachal Pradesh, India. Kangra fort is also near Brajeshwari temple in Nagarakot , Kangra district. There are two stroies which are associated with maa Vajreshwari Temple. One is about Devi sati and other story is about Mahabharata. * According to legends when Devi sati sacrificed her life in his father Daksha's Yagya, Shiva starts Tandava by picking maa sati on his shoulder. Lord Vishnu cuts her body in 51 pieces so called as 51 shaktipeeths. Legends says that her left breast fell at this place , so this is one of shaktipeeths like Chintpurni and Naina Devi temple. 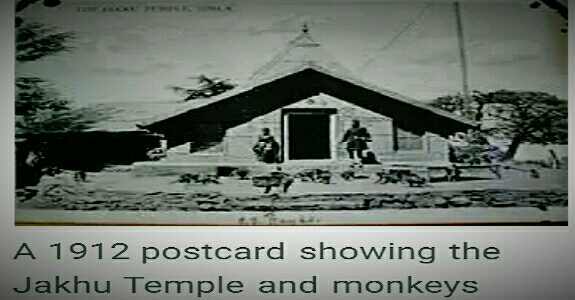 * Other story about temple is associated with Pandava and Mahabharata. According to legends,Brajeshwari temple was built by Pandva's after they saw Maa Durga in their dreams. Brajeshvari Temple is surrounded by a wall of Stone and entrance of Mandir is Drum house. Idol of maa Vajreshwari Devi is in shape of Pindi. It is said that Dhyanu Bhagat offered his head to devi maa at the time of Akbar. So his idol is also present in front of Vajreshwari Devi idol. Structure of temple is quite unique as there are three tombs in temple, which is rarely seen in temples in Himachal Pradesh. Temperature in Kangra district or near Brajeshwari temple is quite high during summers , and chilling in winters( December - February). This temple is one of the 51 shaktipeeths, as devi Sati's left breast fell in this place. Maa Vajreshwari Devi idol is in shape of 'Pindi'. 'Dhyanu Bhagat' idol is also present in temple. There is also a small 'Bhairav' temple in temple complex. There are three tombs in Devi Brajeshwari temple. Pandva's built this temple after they saw Maa Durga in dreams. Several Muslim emperor's looted this temple. Mohammed Gajnavi looted temple Atleast 5 times and looted tonnes of gold and silver. In 1905 temple was destroyed in earthquake and government built it again. Several festivals are celebrated in Vajreshwari such as Navratre, Makar Sankranti, Diwali , dusshera etc. But Makar Sankranti is biggest festival in temple. This festival continues for full week and 'Pindi' of maa Brajeshwari is covered with Makkhan(butter) as it is said that during fight with Mahishasura, Devi maa got some injuries. So she put Makkhan on her body to heel it. How to reach Brajeshwari temple? Devotees can reach temple by road Transport as government and private bus service is available. Taxi services is also available to reach temple. Chintpurni Devi Temple is one of 7 major and 51 Shaktipeeths located in Una District of Himachal Pradesh. Temple is dedicated to maa chinnamasta. Chinnamastika Devi temple is surrounded by Shivalik ranges and bordered area with Punjab state. Chintpurni temple is located at an altitude of about 950 m, and is situated at Una District of Himachal Pradesh. From west of Bharwain (at Dharmashala- Hoshiyarpur road) ,maa chintpurni temple is at 3 km distance. History of Chintpurni temple is quite similar to the history of Maa naina devi temple , when Devi Sati's burning body was severed by Lord Vishnu, 51 Parts of body scattered all over India to calm Shiva's Tandava. 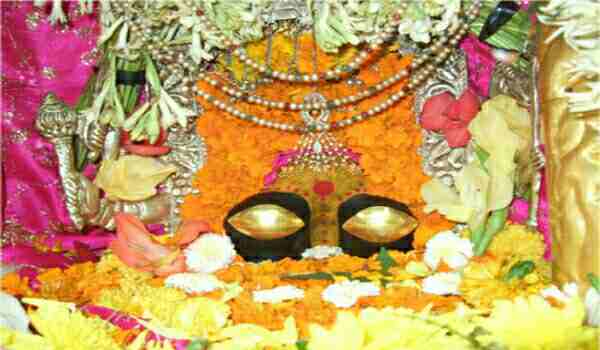 It is said that feet of maa sati feel at this place, so this temple is considered among 7 major and 51 Shaktipeeths in India. Maa Chintpurni is also called as Chinnamastishka (Mastishka is related to head). According to Markendya Purana , goddess Chandi cut her head to quench yogini emanations (jaya and Vijaya)'s thirst of blood. It is believed that a Brahman Mai das built this temple in Chhaproh village. His descendants still live there and worship maa Chintpurni , they are official priests of temple. Maa Chintpurni Temple is opened between 4 am to 11 pm. Devotees bring puri, halwa, sweets , coconut and Chunri etc. Devotees can bring prasad from home as well as market near Chintpurni Temple. Professional photographers are also available in temple for devotees. Temperature near Chintpurni Temple changes according to the season. During December to February temperature is very low and woollen clothes are required. During summer temperature is quite high whereas in rainy season its very humid. There are lots of Hotels , Dharamshala as well as guests house near temple. But during festival times it's almost full specially during Navaratra fairs in July, Ashwin during October and Chaitra in March and April. Hotel Chintpurni Heights also known as Yatri niwas, is run by Himachal tourism located at Bharwain ,3 km distance from Chintpurni Temple. How to reach Maa Chintpurni Mandir? Devi Chintpurni Temple can be reached by all means , Air, road as well as Railway Transportation. Road Transport : Bus and taxi services are available to reach Devi Chintpurni Temple. Nearest Airport: Gaggal is nearest Airport located at Kangra district of Himachal Pradesh. It is located at a distance of around 60 km from Maa Chinnamastishka Mandir. Nearest Railway station: nearby railway station Amb Andaura (station code AADR) , whereas other stations are Una and Hoshiyarpur which are located at a distance of around 43 km and 50 km respectively. [lock] - Chintpurni devi is also called as Chinnamastika Devi and Chinnamasta devi. - Chinnamasta is severed-headed one as well as the foreheaded-one. - Shiva and Rudra Lord protect maa Chintpurni as temple of maa Chintpurni is surrounded by Lord Rudra and shiva temples. 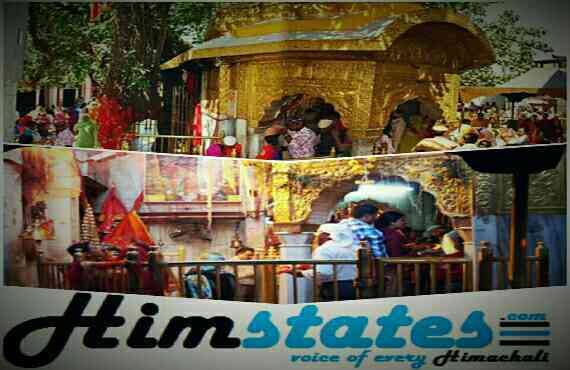 - Devotees can reach temple by Himachal express, Jan shatabadi as well as DMU Shuttle Train Service trains. 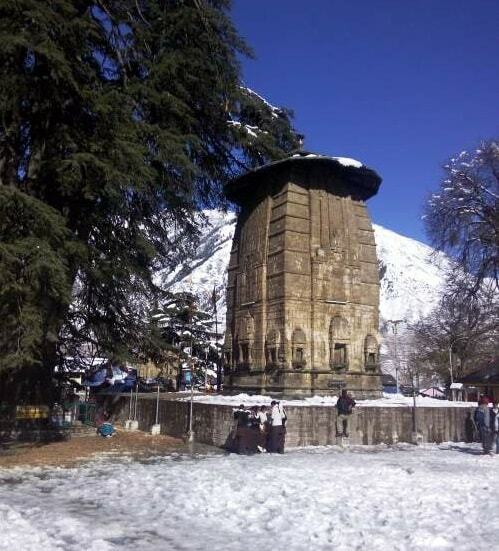 - In year 2012, snowfall was recorded after 52 years in Chintpurni temple. Jakhu temple dedicated to lord Hanuman is located on jakhu hill in Shimla district of Himachal Pradesh.This is an ancient temple in Shimla belongs to Hindu religion. World biggest statue of Hindu deity, Hanuman is located here in this temple. Other than this there are several tourist places near Jakhu Temple in shimla. Devotees and tourists can enjoy incredible sunrise and sunset view from jakhu temple. Jakhu Temple is located on the highest hill of capital shimla , jakhu hills. 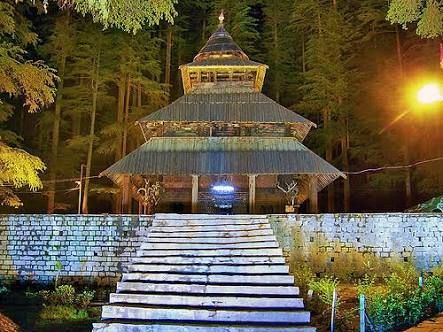 Jakhu temple is situated at a distance of around 1.3 km from famous The ridge shimla. Jakhu temple is at a height of around 8500 feet from sea level. This highest peak of shimla , give great view of snow covered shivalik mountains as well as sanjaulli town. The history of Jakhoo Temple is related to monkey lord Hanuman ,during the epic of Ramayana. This is story when Lord Hanuman was searching 'Sanjivini Booti' to save Lakshmana. During Ramayana, Lakshmana got injured by an arrow while fighting with devil Ravana's son Meghnath . Only way to revive Lakshmana was 'Sanjivini Booti'. When Hanuman dug up the entire mountain after unable to recognise 'Sanjivini Booti'. Lord hanuman landed on jakhu hill to get more information from the sage yaaku. Due to heavy weight of lord Hanuman half of size of mountain sank into earth. After getting information about herb Sanjivini lord Hanuman promised yaaku to meet him back , yaaku made a small temple to commemorate the visit of lord Hanuman . Jakhu is also famous for world tallest statue of Lord Hanuman which was unveiled by Bollywood Actor Abhishek Bachhan in year 2010. 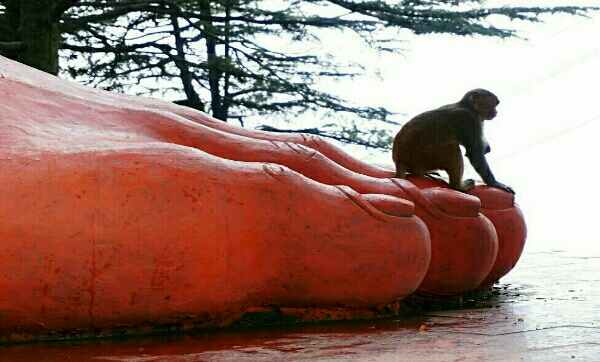 This giant idol of Lord Hanuman is 108 feet high on a highest hill of summer capital of British era shimla. This titanic size of hanuman statue can be seen from a long distance in Shimla. 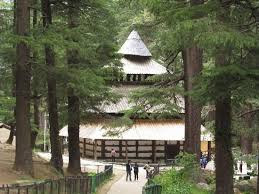 There are several tourist places near Jakhu Temple in Shimla district . Some of them are given below. * Lakkar Bazar, Ice saking rink etc. 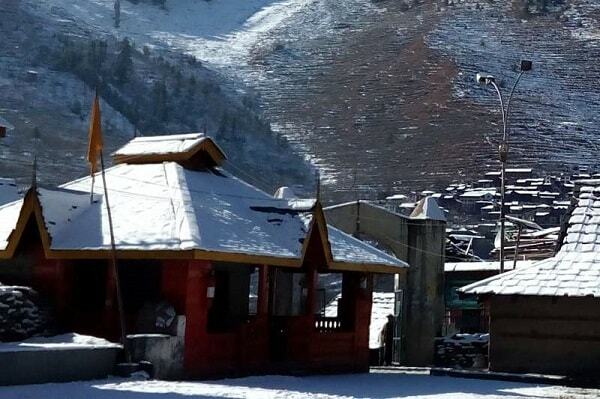 Weather in jakhu hill is freezing during winters and around 15-25 degree Celsius during summer. Snowfall in winters can be seen during months of December to February. How to reach Jakhu Temple? 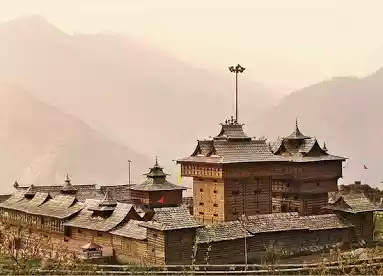 Jakhu temple can be reached by air , road as well as railway transportation. 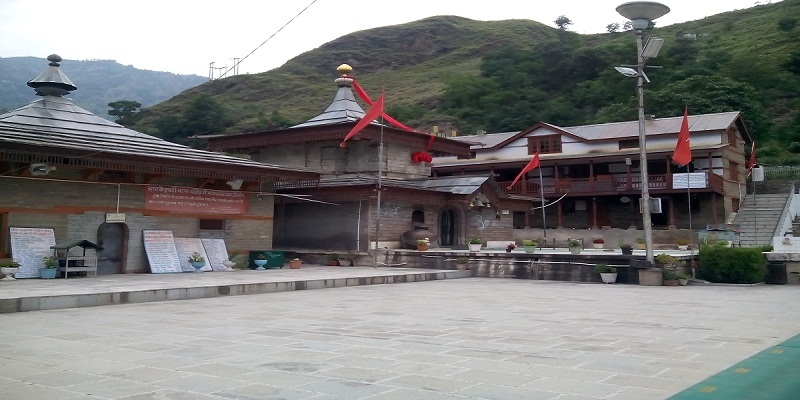 * Road Transportation : Bus and Taxi serves are available to reach Jakhu Temple. - Worlds tallest statue of Lord Hanuman is located here. - 108 feel long statue on 8100 feet high jakhu hill. - Thousands of Monkeys can be seen around Temple. - Temple is far from The mall and Ridge at a distance of around 2 km. - Abhishek Bachhan unveiled world's tallest statue of Hanuman in 2010. - Hanuman statue costs around 1.2 crore rupees. Shri Naina Devi temple is one of the 51 shaktipeeths located in bilaspur district in Himachal pradesh. This temple of maa naina Devi belongs to both Hindu as wells as Sikh people. There is very interesting history of maa naina devi. 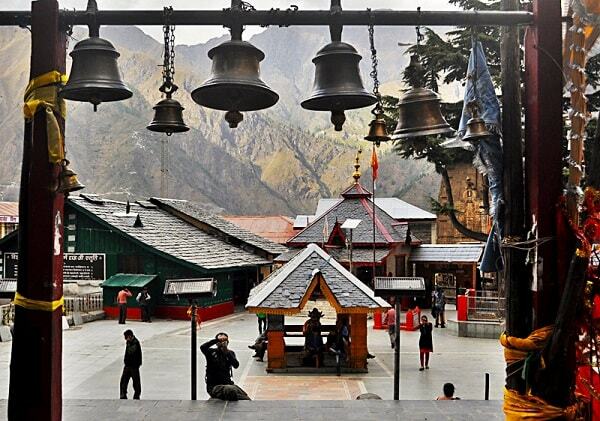 So many tourist places are there near mata naina devi temple which attracts several devotees and tourists every year. Maa naina devi temple is located in a triangular shaped hill, in bilaspur district in Himachal pradesh . This hill is at a height of around 3540 feet from sea level. 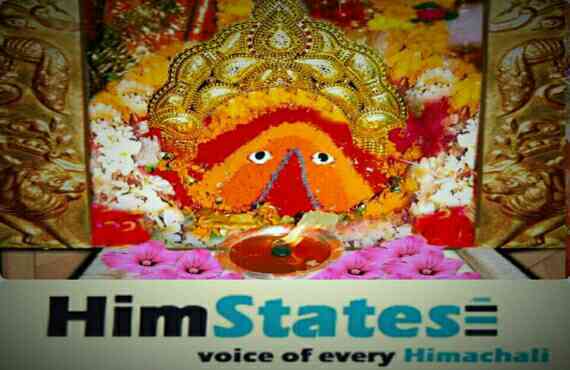 Distance of maa naina devi temple from bilaspur is around 71 km.Mata naina devi Temple is located on NH-21. Naina devi temple is at a distance of around 20 km from Anandpur sahib. Temple is surrounded by Bhangra dam and Govinda sagar lake. Naina devi temple belongs to Hindu as well as Sikh people. 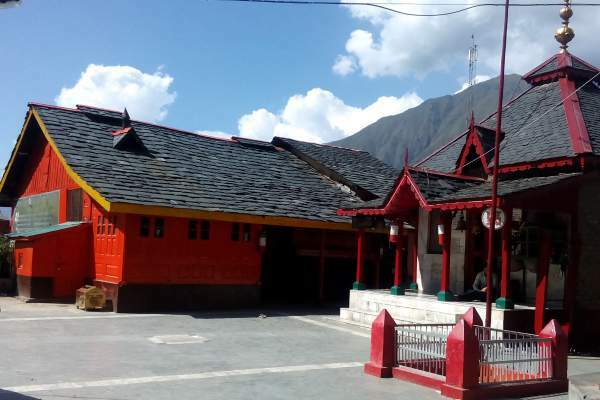 There are three stories behind Naina devi temple. - According to first mythological story , it is said that when goddess Sati or known as Parvati burnt herself in bonefire, Lord Shiva got distressed,corpse of his wife Sati on his shoulder and started Tandav dance across the country. - All deities were angered with it and lord Vishnu released his Chakra and cut sari's body in 51 pieces. That is why there are 51 shaktipeeths in country , Naina devi temple is place where maà sari's eyes fell down. So called naina devi temple in which nain means eyes. 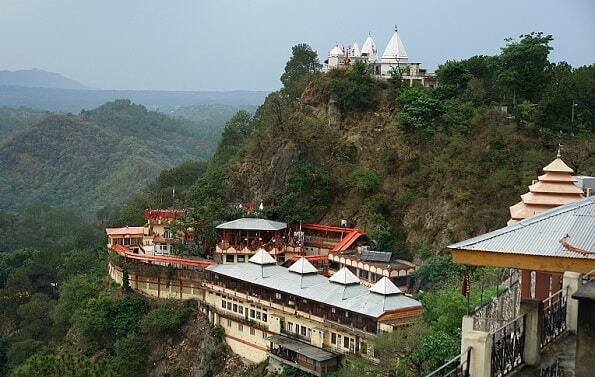 Shri Naina Devi temple is also linked with Mahishasur, so called as Mahishapeeth also. Mahishasur was immortal as power given by lord Brahma but with one condition that unmarried woman would defeat him. He started terror everywhere, later he got impressed with beauty of maa naina devi and proposed her for marriage. But Devi put a condition that she will marry only if he will defeat her. Devi naina killed demon and took her both eyes out. So called as naina devi temple. According to Sikh believe it is said that Guru Govinda singh ji left his military against Mughals in year 1756,he did yagna for blessings of thedess naina devi.After maa naina devi's blessings,Guru Nanak dev ji defeated Mughals so Maa naina devi temple is also called as “Temple of Strength” . - "Mangal Aarti" is first Aarti in morning and it's timing is 4 am in morning. Priest of temple open gates of temple. - Second Aarti is "Shringaar Aarti" and it's timing is around 6 am in morning. All kind of pooja and snans are performed by priests in front of devotees. - There is a noon Aarti also around 12 and called as madhyann Aarti , and last Aarti is around 6 pm in everything. Temple are opened for devotees whole week in timing of 5 am to 7 pm. Temple trust provides facilities of free Langar in 24 hours everyday whereas boarding facility for devotees is also available. Around 1000 devotees can stay in boarding of trust. There is also paid boarding facility provided by trust of maa naina devi. There are 45 rooms and 14 dormitories and these boarding are named as “Matri Aanchal”, “Matri Chahya” and Matri Sharan”. Temperature in bilaspur district is always quite high. So this region comes in hot region. How to reach maa naina devi temple? To reach maa naina devi temple air , road and railway transportation is available as given below. Road Transport: Temple is located on the National Highway 21 ,buses and taxis are available for this place. Himachal pradesh is also known as devbhoomi, and capital shimla have so many spiritual places specially temples. One of famous temple on which famous song ' chal rampur chal meri sajni' is made , that temple of Sri bhima kali is located at Rampur bushehar in shimla district, Himachal Pradesh. This temple is one of popular temple of Hindu religion people. A new temple was made in year 1943 inside this temple. 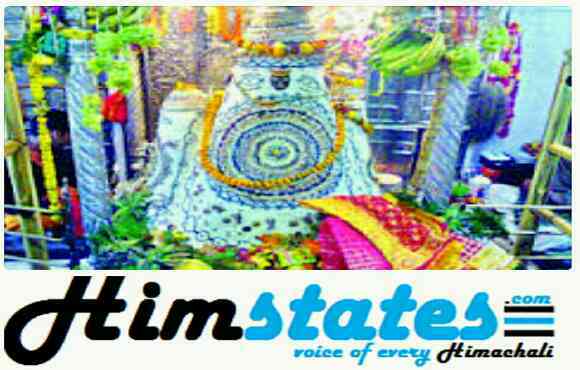 Many stories are hidden in history of bhima kali temple. There are two major stories behind temple of bhima kali temple sarahan. First is that this princely state of bushehar was ruled by Banasur. Banasur and lord Krishna had fight and head of demon Banasur was buried just in front of temple gate. The second story behind this place is about Devi sati. During Daksha-Yajna devi sati's ear fell here. After that incident this is a spiritual place for Hindu people and community. In the new building of Maa bhima kali there is an idol of maa parvati. Bhima kali temple architecture is quite different from Hindu temples. This temple is made in Tibetian and Buddhism style. Atleast one hour is required to enter temple complex from grounds of bhima kali temple complex. 4. During last Aarti, shalokas from the holy books are chanted. Most important thing to know about temple is that temple is only opened during Aarti time ,rest it is closed. During summer temperature is very pleasant in area whereas in winter temperature drops so much. Visitors may need woollen jackets and clothes during winter so summer is best time to visit as temperature is between 20-30 degrees Celsius. To stay in temple rest house permission of Sub division officer of Bushehar i.e. SDM is needed. There is also a forest rest house to stay for devotees and it is at a distance of just 5 km from temple. Booking to stay in forest rest house can be done at the office of DFO. Public work department or Pwd also provides accommodation to stay. Booking can be done at the office of PWD in Rampur bushehar. How to reach Bhimakali temple? NH - 22 is available for Rampur bushehar and 180 km from shimla. To reach temple facilities of HRTC buses ,private buses and taxi services is available. Nearest Railway station - Shimla railway station. Hatkoti Temple one of the religious temple of himachal and center of attraction for tourists. 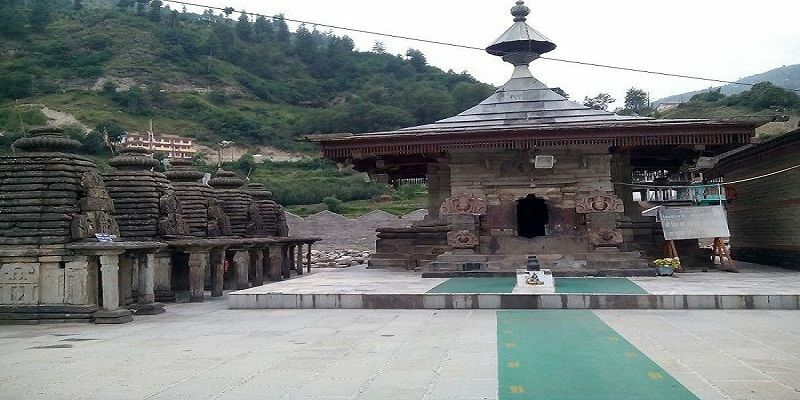 Hatkoti Temple is located in Hatkoti(Jubbal),around 100 km from shimla, capital of himachal pradesh.This temple is dedicated to lord shiva and goddess Durga called as maa hateshwari.It is believed that this is spot where the gods fought a Battle.There is also a temple of shiva. .Some believe it was established in Third era due to some scripted stones of Gupta age's have been found different places of this historic place. But the most important thing about this temple is believe that it was made during Mahabharata period, And some proof of this believe can be seen while entering temples premises. There are five stone called 'Deols' in hindi and pahari. This is believed that the temple was used by "pancha pandva's" as their toy houses. In the temple complex there are a kirtan ghar and a rest house. "Hateswari(Shakti of Hateshwar) and hence this place is known as Hateswari, one of the main residences of Shiva and Shakti." The shrine houses a beautiful idol of the goddess in bronze. The idol represents the goddess with ten arms, riding a lion, holding weapons and lotus flower and killing the demon Mahishasura. Hatkoti temple is located around 100 km from shimla ,3-5 km from sawra and 10 km from Rohru.This temple is located at 31.101°N 77.711°E. It has an average elevation of 1,440. Hatkoti is situated along river Pabbar. Shimla tour for a person would remain incomplete this wonderful temple with lot of mysterious believe. Best time to visit temple is march to october, however temperature keeps changing with time here.whereas in November to February the place become so cool, still its good to visit here and experience of snowfall. Temple remains open from morning 6 am to 10 pm at night.The photography is free within temple premises. It is said in Himachal and Rohru, Jubbal area that maa hatkoti idol changes its expression according to time,sometimes smiling and sometimes anger on her face. People in this region relates it with mood of nature. Fairs are organised time to time to worship maa shakti durga.Thousands of devotees visits temple and offers Halwa(Prasad) and flowers to worship maa Durga in Form of maa "Vaishnavi"
How to Reach Hatkoti Temple? Hatkoti is situated along pabbar river at a distance of around 105 km from states capital.Tourists can reach temple by road, via kotkhai, khadapathar, jubaal. There is proper facility of buses and taxi transportation.